At the end of my last post on abundance, https://tarotsalve.wordpress.com/2012/06/10/abundance-part-1-whats-wrong-with-talking-about-abundance-3-problems/, I promised that part 2 of this series would include a tarot spread for answering questions about abundance. So, here it is! My abundance spread includes three cards. I lay it out so that the first two cards are on top, and the third is centered under the top two, so the spread forms a triangle or arrow shape. 1. What kind of abundance do I already have in my life? 2. What kind of abundance do I most need in my life? 3. What is my suggested strategy for manifesting abundance? 1. What kind of abundance do I already have? reversed Knight of Cups. I am generally willing to be turned upside-down by my emotions and intuitions, and I pretty much have been. 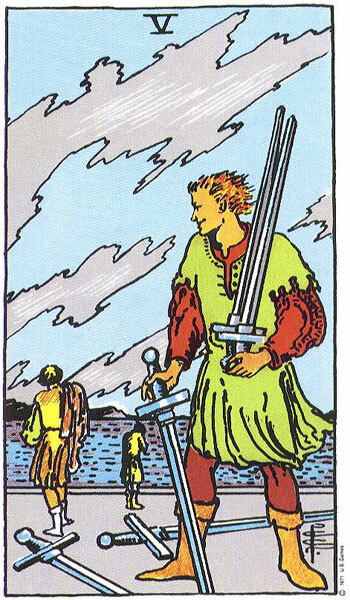 I don’t think the Knight of Cups is me, though, but rather that he represents people in my life who are extremely sensitive and often head-over-heels from it. Between my moodiness and that of various people around me, what I have in abundance are emotional and intuitive flash floods (something you get in the desert, which is where the Knight of Cups appears to be traveling). I am confident that there is a positive use for the emotional energy of a flash flood, but more often I haven’t harnessed that energy and instead, it has impeded my productivity. This relates to what I said in my previous post about not assuming we understand what the universe means by abundance. If I am moody or the people around me are, and it starts to impede my productivity, I wouldn’t normally regard this as a form of abundance. But maybe this card is encouraging me to look at this situation from a different angle, and recognize that there is energy here, abundant energy, if I could find a way to work with it. 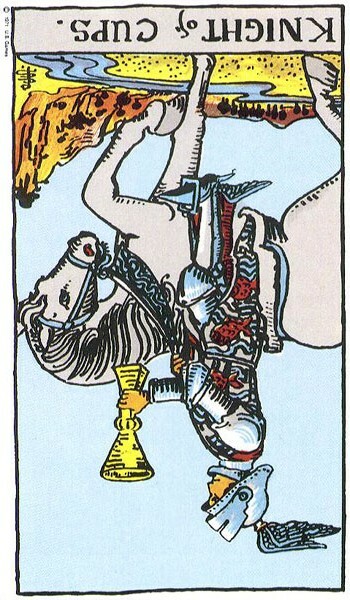 If I could turn the Knight of Cups right side up, I could contain all that emotional energy and intuition in a cup, and drink from it as needed — right? The desert around the Knight of Cups really speaks to me, too, since I was just in the desert (the Sonoran desert) and was very struck by the clean, clear energy there. It’s as if the mountains were giant crystals clearing the energy of everyone around them. Coming from the Midwest, where there are no mountains, the difference was very noticeable. So I find myself wondering if there is an abundance of that crystal-like desert energy around me, or if I am still carrying that energy from my two and a half weeks in the desert. Somehow, I think this card relates to an abundance of energy from crystals and the earth — I’ll have to meditate on what that means to me, specifically. 2. What kind of abundance do I most need? 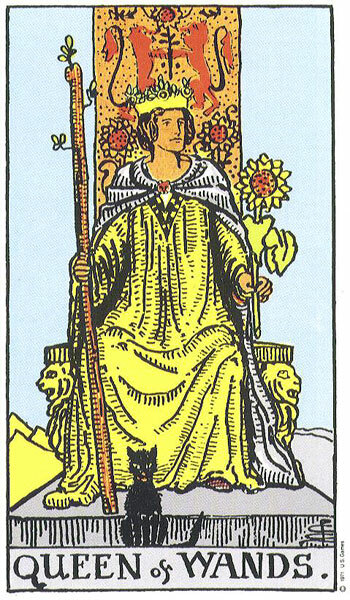 Queen of Wands. This card didn’t puzzle me at all! It says to me that the abundance I need is confidence, poise and creative energy. That I need nature and animals and mountains (or at least crystals and some kind of connection to the earth) around me. That I need to take charge of my life and be the Queen of it, showing in abundance my ability to direct my own path. To me, this card seems to offer clear advice. 3. What is my suggested strategy for manifesting abundance? Five of Swords. This is my least favorite card in the deck, so naturally it came up as my own suggested strategy! I was so aggravated by this that I almost pulled another card, but then I decided that every card has something to teach me and that I need to look for the lesson this card holds. And what is that lesson? I don’t see myself as the figure in the foreground, but more as the figure on the left. I think my lesson is to walk away from struggles, to choose not to fight battles that don’t need to be fought — not to waste my energy or the fire of my soul on such things. To watch out for sabotage, even unintentional sabotage, from others in my life. That I might have to learn to be more self-interested and less passive in the face of the theft of my time and energy from others, even when those others are people I love. And maybe to find strategies for fighting back without using a cutting instrument like a sword (or sharp words). If I avoid defending my time because I don’t want to use sharp words to do it, I end up allowing others to defeat me (even if they didn’t mean to). There are other methods for dealing with time/energy vampires. I already know what some of these methods are, and they have to do with letting go of negative energy, being protected from negative energy, calling my soul back from other people’s dramas so that I can be present for the work that I need to do. I believe my next, most critical step on my path is to finally learn to really let go, and at the same time, to finally learn to set good well-enforced boundaries. Please try my spread on your own, and, if you are willing to share, let me know your results in the comments section below. Previous Cards for the Day: The Moon/Reversed Magician: Intuition Puzzles Us, Hesitation. Yes, sometimes I do pull a clarifying card, but for some reason I didn’t this time. Thanks–I’m so glad you liked the spread! Heh. 4P upright, 8S reversed, High Priestess, reversed. I don’t have a paycheck, but I do have savings, so, yeah. I need to quit seeing myself as trapped by “unemployment”, and look beyond the “woo woo” stuff to support me, look for a paycheck job for the time being (and there were a couple of highly suitable ones listed in the paper today–timing, eh?). OK.